The essential GMs reference to Star Wars: Force and Destiny. Take your Star Wars: Force and Destiny campaign to the next level with the Force and Destiny Game Master's Kit. Complete construction rules provide players with a chance to build their very own lightsabers, using crystals they harvest during this kit's brand new adventure. In addition, brand new rules and advice for Game Masters concerning Knight-level play lets GMs challenge players with adventures worthy of aspiring Jedi, and a deluxe Game Master's screen places the most commonly-referenced rules close at hand. This product includes a 32 page book and a 4-panel Game Master's screen. 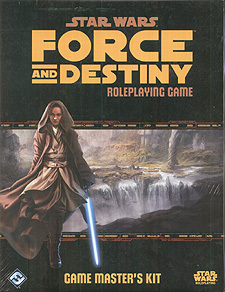 A copy of the Force and Destiny Roleplaying Game core rulebook is required to use this supplement.